Heat oven to 350°F. In ungreased 15x10-inch pan, unroll dough into 1 large rectangle (do not stretch); press perforations and edges to seal. Brush 1 teaspoon of the oil over dough to within 1 inch of edges. Prick dough with fork to prevent bubbles. Bake 9 minutes. Meanwhile, in 10-inch skillet, heat remaining 3 teaspoons oil over medium-high heat. Add onion and garlic; cook 2 to 3 minutes, stirring frequently, until onion is translucent. Add tomatoes; press tomatoes with back of spoon. Spread tomato mixture on partially baked crust to within 1 inch of edge. Arrange hearts of palm slices over tomato mixture. Bake 2 minutes longer. Before serving, sprinkle with parsley. If preparing ingredients in advance, cover hearts of palm with damp paper towels to prevent them from drying out. Like it spicy? Add hot sauce or crushed red pepper flakes to the tomato mixture. 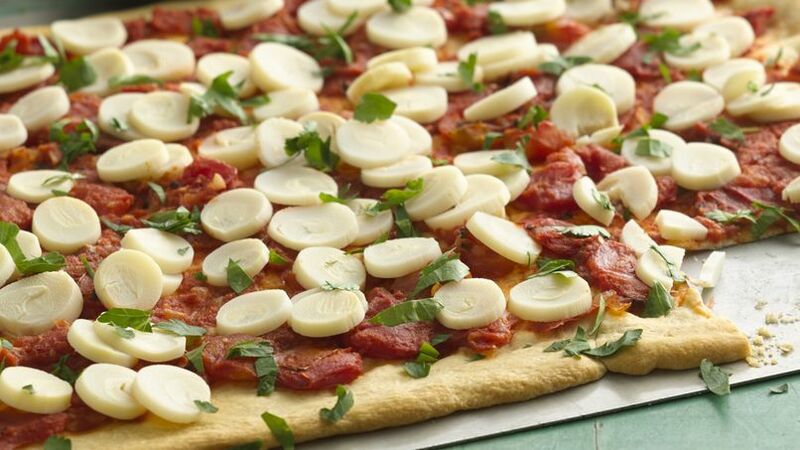 An Italian staple with a Brazilian twist.